Bethesda's latest video game, , launched last month with its share of uneven reviews and responses (including our own), and chief among players' complaints is that the always-online game is quite buggy. But to borrow a term that Bethesda itself used to describe the game's pre-release beta period, is facing a new "spectacular issue," albeit one that's technically outside of the game client. Instead, the issue comes from the game's equally troubled $200 Power Armor edition: buyers of the Power Armor edition who went to Bethesda's site to resolve the issue were seeing their personally identifying data (PID) leaked to everybody else who was trying to resolve the issue. This requires backing up for context. could be pre-ordered in a pricey Power Armor set, complete with a wearable replica helmet and a tote bag. As I pointed out in a November unboxing article, that bag turned out to be "a cheap, flimsy carrying case," but what I didn't realize at the time was that Bethesda had originally advertised a higher-quality canvas bag as part of the $200 set. Once orders for the set began shipping to players, their outcry prompted Bethesda to respond with a token of apology: a $5 voucher for 's in-game cosmetics store. Fans took umbrage with the token by pointing out a hilarious irony: that amount of credit couldn't even buy a virtual canvas bag within the game in question. On Tuesday, however, user reports began circulating with an ominous allegation: that anyone who filed a support ticket at Bethesda's site was receiving a lot of replies to their threads. As in, ticket going through the system. 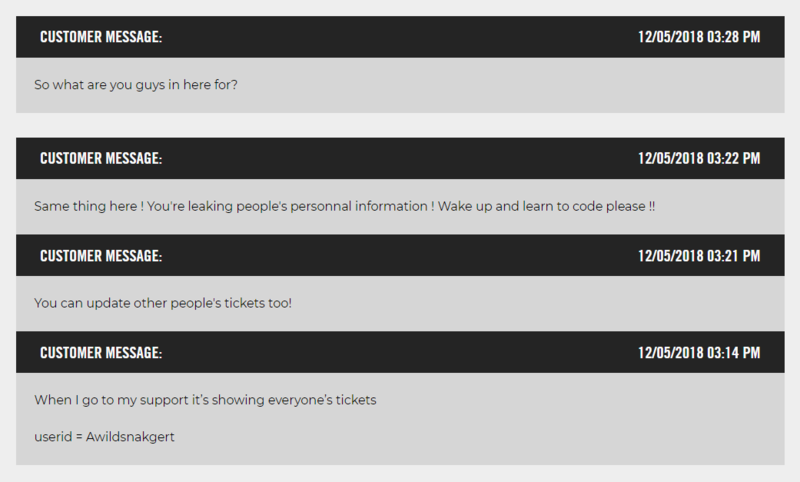 I went on the support website today to update a ticket of mine, and surprisingly (or not...) I ended up being able to see all sorts of tickets, with people putting their personal information in them, like receipt screenshots, names, addresses, and so on. I'm assuming this is a bug in the website, because I don't see for what reason Bethesda would make tickets public. Other Reddit users added their own allegations of the same issue, with one public screenshot showing multiple, confused replies to the same support-ticket thread. (This public screenshot includes no personally identifying data; screenshots with other users' addresses and photos have since been taken down.) We have reached out to affected Reddit users and will update this report with any responses. Bethesda representatives did not immediately respond to Ars' request for comment about the validity of these claims or how the company squashed the bug in question.